Wow! It’s been more than a month since we returned from London, and boy oh boy, time zooms past! Yours truly has been busy fighting datelines, and yes, it’s time to catch up on ALL those outstanding articles here! Like its title suggests, we will be taking you through our foodie adventures in London. 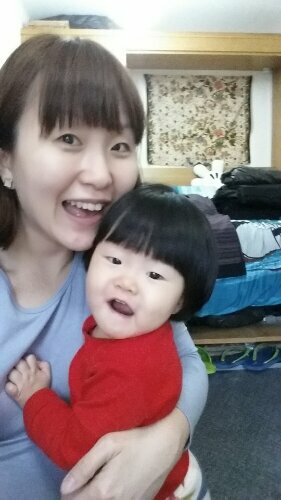 We stayed indoors quite abit during the first week as I was solo parenting while hubs was in Stuggart for work. Incredibly, we manoeuvred our way for supermaketing (not forgetting supermarket hopping!) a few times by foot, while pushing a stroller (nope, Vera doesn’t take the stroller!) and babywearing a 16month old and fighting the cold with an expectant mama. Best of all, we had to manage a sticky tot, prepare and cook and get ready to head out. Haha! Most days, it was just two silly women and a baby. The BFF’s hub was at work, so we were left to our own devices (heh!). Some days, her Polish husband whet our appetites with some of their traditional food. Alright, let’s get eye-feasting, shall we?? COFFEE. YES. That familiar aroma! After surviving a 17hr flight with the little one (thankfully, she was really good on the plane! ), we finally touched down and warmly greeted by familiar faces and hugs – my BFF, A, and her hubs, L! While waiting for transport (they called for a private one at £27, although when they booked, the operator quoted £29 over the phone) which could accommodate 4 adults and baggage, we had a cuppa at Coasta in the airport to awaken our senses that morning! Mummy couldn’t resist taking our first selfie when we reached our home away from home! And then, lunch is served, lovingly whipped up by our hosts to welcome our little family! The little one gets to nom nom first! First, a wefie, before we tucked in! After lunching, daddy had to scoot off to catch his flight to Germany for work. Boohoo! Solo parenting nightmare excitement begins! Today was our first day in our “new home” for the next two weeks, so we started unpacking our luggage and sorted out what we had. Before long, it was dinner time! And I can’t believe I don’t have any food pics for our dinner! Must have been too hungry chowing down our Smoked Salmon Fettuccine! Thankfully, baby V settled well and we had a good sleep that night. Guess she’s probably tired from the long flight too. We woke up to an easy breakfast, hearty to boot! We had a healthy (and super filling) start the next day – Scottish Rolled Oats, cooked by our sleepy hosts. Paranoid mama lets Vera have blackberries and rolled oats as she’s yet to try bananas yet at that point. Things were a little different as the days went by… LOL! Just got out of bed! Getting cold indoors! Preparing to head out soon! Okay, we had to deal with a sticky tot on the very first morning.. she pretty much didn’t want mama out of sight and well, got abit grouchy when I was trying to prepare her lunch so we could take along with us. Babywearing this bub while 2 grown-ups were busy chopping and stirring in the kitchen for the little one’s meal. See lah, Home Economics comes in handy now! 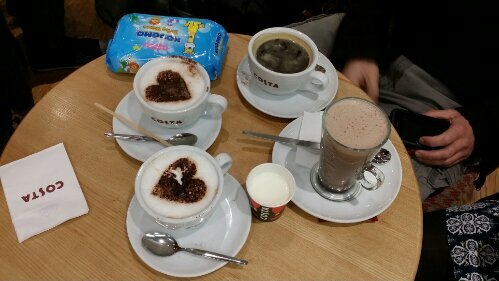 Our lunch at Café Nero, Weybridge Town Centre – Godma’s gotten her FREE drink! She’ll be sharing deets on how to score free stuff while living in London! Stay tuned! Baby’s meal: Porridge with Chicken, Swiss Brown Mushrooms, Tomatoes and Organic Baby Spinach in Ikan Bilis stock. Adult’s meal: Mummy had a Tuna and Cheese Melt with a cup of Flower Tea, while A had Ham & Cheese Sandwich with Hot Chocolate. Negotiating for more bread with the Godma! LOL. And so the baby girl decides that our sandwiches seemed tastier than her food! Had to coax her into eating her piping hot porridge by placing a pinch of bread on each spoonful. After our meal and a poop-ful diaper change in the KolaKare of Café Nero, we went to Boots, Waitrose and Morrisons – literally supermarket-hopping! Finally done at Morrisons! Ahhh, you caught me looking “Auntie”, eh? Had to get diapers because the hub declared that we should “travel light” this time, and yes, that meant we had to grab essentials for our two-week stay! Best of all, Pampers was on a bundle deal (woohoo!) and she’s been using them back home anyways. So, buy first and worry later about lugging it home. HA! With a cranky bub (probably jetlag) who wanted to nurse and promptly dozed off while we took a slow stroll back home in the cold evening. Time to belly up some hot dinner too, which L had prepared after returning from work. Look what’s bubbling in there! Our meal: Wholesome Chicken Broth Vermicelli Pasta with Carrots, Red Dates and Wolfberries, for baby and adults! Almost like Korean Ginseng Chicken Soup, minus the Ginseng! And, the little one decides to drink from a cup, glass one, no less! We had a few heart attacks! After cleaning up and changing into her PJs, we had an early night (ahem, early by our standards because we usually fall asleep around midnight. Now, now, don’t judge please.). She fell asleep pretty quickly, and didn’t wake up as much as when we back in Singapore! Things were looking bright! We’re into Day 3 so quickly! And A’s got an appointment with the gynae, so I decided to pull a fast one for brekkie when baby V was in a better mood for our hosts. No way was I gonna let her step out with an empty tummy! So, what do I do? Dig out a quick meal from my bag of tricks! Done to death but it’s different every single time! Our meal: Savoury Egg Muffins with Chestnut Mushrooms, Organic Baby Spinach, Carrots and Cream Cheese. All of us had the same – super time saver! This happy face says it all! 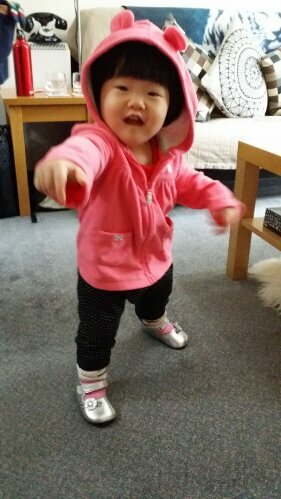 And she was all-ready to put on her shoes and go out! After struggling to prepare and do other stuff, it was time for quick lunch! So, L made some Polish pancakes for all! Uncle L busy in the kitchen! Polish wheat flour and EVOO! And she starts aiming for the raspberries. Haha! Adults had Nutella and banana options! After lunch, we zoomed out for shopping! Will be putting up our shopping trails in a separate article – do keep your eyes peeled! The shops closed pretty early, so we headed back in time for a yummy dinner with fresh salmon bought from Morrisons the day before. Check out those chunks of meat! With full bellies, we chatted and caught up with L on his day at work, sharing with us funny happenings before we got ready for bedtime. Rise and shine! A sunny morning greeted our sleepy faces with English muffins! We did our laundry downstairs, which was great because it meant that we could actually travel light! But in photos, it’d looked like we kept wearing the same outfits. HAHAHA! Nonetheless, when it comes to travelling during winter (plus a baby! ), all chances of travelling with lesser stuff are greatly welcome! And because we were bunking in with A, we saved weight from lugging toiletries and heavy overcoats too. No fashion show for moi! Soon with all that moving around, the lunch bell rang!! After sweating it out, it was time to refuel with some homecooked love. Guess what’s on the menu?? We replaced sausage with chicken for the little one and she loved the naturally sweet soup, sans salt! She kept helping herself to that broth! After our meal, we had some cosy chat time together, and off to bed it was. Sleep tight, my cow girl! This trip, we saw our little cupcake gaining lots of independence and achieving new milestones. In just a span of two weeks, she surprised us all and it’s indeed ultra heart-warming to see her progress, yet at the same time, hoping that time won’t go pass so fast. Here, she’s seriously enjoying her breakfast. Baby’s meal: Healthy Times Organic Teddy Puffs (we brought them over from home) with Fresh Milk. And yes, mama caved in to let her have a go with bananas! Shoved those paranoid thoughts aside. Adult’s meal: Weetabix, Granola, Blackberries, Nuts, Bananas – it’s take-your-pick breakfast buffet! And then mummy had to squeeze in some work again…. the little one needs to learn that food does not come easy! We work hard to fill our tummies! After all that adrenaline-pumping work, A and I enjoyed our girlie catch-ups. It’s so surreal to know we’ve been friends since we were 7! And fast forward n years, we were meeting half way round the world – me with my daughter and she with hers in da belly! This trip allowed us to enjoy each other’s company with the non-hurried pace we went through mostly. Unusually slow pace of urbanites, but I guess it didn’t take too long to get accustomed to. Unlike usual trips where we rushed to cover popular sightings and snap a zillion photos, we had the luxury of enjoying each other’s company, going s-l-o-w and have all those girlie times together. We idly sashayed to the kitchen to prepare for lunch. Notice how fast time flies when you’re really taking a break from all the craziness of the rest of the world.?! It’s such an irony! The trio had the same meal, except that Vera’s meat was unseasoned. Our meal: Zha Jiang Mian (Soy Sauce Minced Pork) with Spinach Noodles served with Organic Baby Spinach with Garlic. We got kinda sucked into all that shopping and decided to order Chinese-Thai take out for dinner. L kindly drove over to collect them and drove over to pick us up. Bubba was having a meltdown and rejecting dinner, hence, no food pics. We woke up to freshly baked bread by Uncle L! Yum Yum! Looks like a bread buffet coming up, and baby V was so excited to get her hands (and teeth) on them! How does my sandwich look?? I must have had 2 or 3 of this. Heh! Our meal: Freshly Baked Sundried Tomato Bread with choice of Hard Boiled Eggs, Ham Platter, Cheese Platter and Salami. Cheese Spread, Garlic Herb Spread and Butter to go! The lovely folks at Carluccio’s gave Vera a kid’s bag with an interesting book on Italian pasta (I enjoyed reading it!) and some kiddy activities with coloured pencils. But she’s a tad too to young to figure it out, so she was happy to just take those coloured pencils in and out of their box. Haha! Truffle Potato Gratin and Tempura Veggie Sticks! Our meal: Sliced Beef with Plum Sauce and Onions, Stir-fried Mixed Veggies served with rice. After dinner, it’s daddy’s turn to take the shift, although it will be shortlived! HA! As if… oh well, we looked forward to some fun venturing further the next day! Daddy sprung out of bed in the morning, and hopped over to the kitchen to make breakfast for all. He was ultra thrilled because this day meant that he was to travel to Liverpool to catch a ‘live’ match the next day! While we had some time to spend together, it was short-lived, but hey, better than none! The itinerary for the day was to visit Portobello Market. This was one of our fave haunts during our last trip, and we were elated to bring home wonderful touches to our then-new nest. And that also sparked the beginnings of our nutcracker collection! It’s been growing the last few years, and it’s so difficult to cherry pick a few selected ones to take home with us. Our collection has grown over the years, where each piece comes from a different country. And, A, has fed our lust from the start too! LOL. Besides quirky finds, Portobello has tons of food to go for. Being greedy, we definitely had to eat our way through, but since we only had a few hours before the hubs had to catch his train, we had to steer our way through food haunt. My “wonderful” memory remembered very vividly of the cute window display they had years ago. Acrylic cubes where pretty cupcakes sat and looked out to passer-bys through the glass. Was so glad to finally have them this time, squeezed our way through the tight space and ordered those sweet treats. A and I were spoilt for choice! And the crowd was expectedly indecisive too. We bought them and had to tahan till later before eating them because we wanted to go for some proper lunch. But just to say, the cupcakes were really sweet… like a tad too sweet! We had Red Velvet, Carrot Cake and Salted Caramel. We sneaked downstairs for a simple meal. This area was where antiques, vintage knick knacks like watches, clocks and homeware were curated and looking for buyers. We ventured around the area and was pleasantly surprised to see that changes were minimal although 6 years had past. Interestingly, one noticeable change was one of the cafes that used to be near this paella stall. American Apparels was still there! And the irresistible aroma from those huge pans were severely inviting! We HAD to grab a serving! After digging in, we wandered around a little longer before hubs had to leave to catch his train to Liverpool. FINALLY, an item struck off his bucket list! YNWA! So the three of us ventured around with a nursing bub, and yours truly’s back and legs were aching. We decided to start making our way back since it was going to take us another 2hours. It started to drizzle and the winds got stronger – ugh! And, all we could say that we were glad that homecooked dinner was waiting for us in the comfort and warm of home away from home! HAHA! Apparently, Vera seconded my thoughts too! Baby’s meal: Stir Fried Beef and Onions Marinated with Orange and Sesame Oil, Avocado and Rice. What a way to have bak kwa metamorphosed into a palatable dinner dish! And to savour those Chinese New Year goodies with a twist. Heh! We had some desserts (hehe! ), chatted and hit the sack. We might have skipped past this day with a tired tot… and the only few food shots I had? The little one chomping on a cheesestick for snack after we returned from Home Bargains! Can’t believed I survived carrying her in my arms for 2hrs while shopping! Well, when a baby’s gotta sleep, a baby’s gotta sleep! What with the professional nap striker, eh? LOL! Afterall, Daddy was returning the next day after his Liverpool match! Hi saw that you made healthy meals for your bb even so far away from home in London! I’m also planning to bring my 18mth old baby to norway Soon. Any ideas of what type of non perishable food for me to cook? Try to avoid eating outdoors as most kids meal are still filled with salt and sugar which my bb is doing perfectly fine without so far… so don’t want it to start from this trip and making it a habit for him yet! I have been dreading traveling with my little one due to the food prep… But you make it look so easy! Now i’m feeling super inspired! Wow looks like you guys cooked and ate your way through all the London supermarkets! Haha what an interesting perspective of London – with all the home cooked food whilst travelling! We were there in Londond doing a DIY and remembered the food there was quite dear but we love the city. Your post tempting us to return! Next Entry No Fishy Business with this Steamed Dish!